This three year project with a one-year no-cost extension (2009-2012) was conducted as a joint project with the University of Maine, University of Massachusetts and University of Vermont with a performance target of producers adopting cover crop strategies and reduced tillage strategies on 3000 acres with an associated reduction in fuel and fertilizer cost as well as conserving soil and nutrient applications. In addition, our performance target predicted a decrease in purchased grain inputs by dairy farmers through improved forage quality. Survey results (109 producers representing 33,000 acres of corn ground) indicated that 33 of these farms had adopted no-till corn as part of their cropping system. Those 33 responders documented an increase in no-till acres from 953 acres in 2010 to 3947 acres in 2012. Associated NRCS data from Maine, Vermont and Massachusetts indicates that 9,473 acres of no-till corn was grown in 2012. Cover crop adoption for the 3 state region also increased from 9701 acres in 2008 to 15,882 acres in 2012 with an average cost of $30/acre. Producers indicated that they saved an average of 5.7 gallons per acre (~$23/acre) with no-till with an associated 2.75 hr/acre savings in labor (@$10/hr means $27.50/acre). For the 3947 acres represented in our survey of no-till corn grown with cover crops in 2012, that represents a net direct benefit of $194,196 to those growers. If we extrapolate those results to the 9473 acres of no-till corn reported by NRCS in 2012, we see a net benefit of $478,000 to farmers in Maine Vermont and Massachusetts. Growers also noted additional benefits, including improved soil moisture control, reduced fertility needs and improved soil and feed quality, although these were not as easily quantifiable. New England corn silage production is estimated at 162,000 acres with an estimated value of $178 million for 2012. This crop dominates the landscape in the Northeast and also accounts for a substantial portion of the cropping expenses of dairy farms in the region. Recently, environmental rules and USDA incentive programs have encouraged the adoption of cover crops after silage harvest. Unfortunately, New England’s short growing season and a long standing emphasis on longer season hybrid selection for maximum yield has made successful adoption of cover crop strategies difficult for dairy farmers. In addition, as farm sizes increase to try and improve efficiency, dairy producers tend to increase corn silage production and reduce rotations to perennial sod crops. This trend has large environmental impacts, including increased use of pesticides, higher rates of erosion and reduced soil health. This project developed through input from producer groups in Maine and Vermont who were looking for reducing costs and time associated with growing corn silage. Corn planting and spring harvest of first cutting hay/haylage have always created a time management issue for Northeast dairy farmers who have limited time to optimize both crop requirements for producing top quality feed for their livestock. Delayed harvest of first cutting by even days in late May and early June results in large increases in grain purchases for dairy farms that have to compensate for reduced digestibility of their harvested forages. This fact tied to the need to plant corn silage crops at the same period of time to maximize the growing degree requirements of the corn crop results in a compromise that reduces profitability. In addition, producers have traditionally chosen longer season hybrids to maximize yield at harvest, without regard to the consequence of poor quality and the inability to plant cover crops due to our climate restrictions in the northeast. Looking at all these factors, the project leaders looked at how best each could address some of these issues. All three states conducted corn silage varieties for all years of the project (and will continue after the project is complete) to evaluate the yield and quality of corn silage varieties, especially focused on shorter season varieties that will facilitate cover crop establishment. Cover crop establishment and termination studies were conducted, evaluating timing and impact. Additional research was done to evaluate the nitrogen conservation potential of cover crops. 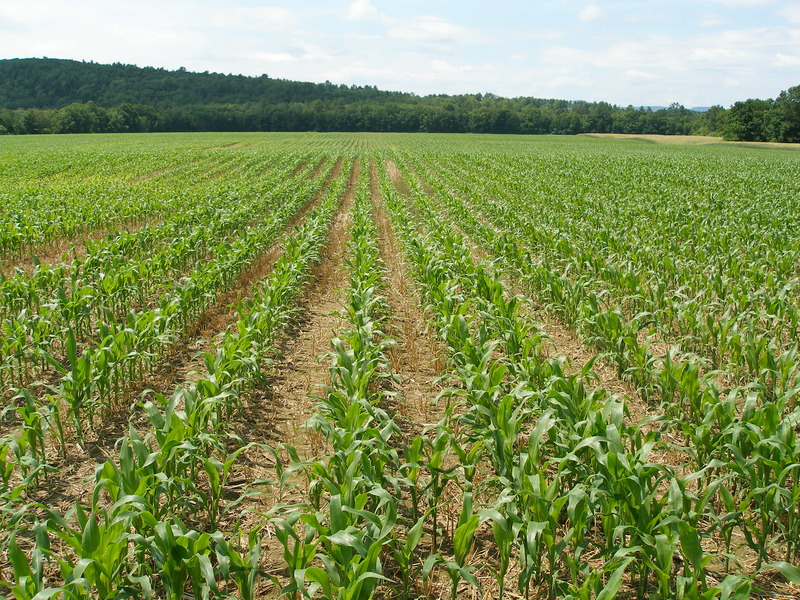 In Maine and Vermont, extensive work was done to teach producers about no-till corn production, including equipment technology and the integration of cover crops with no-till production. Finally, work was done to research and demonstrate manure management techniques with no-till and cover crops so as to minimize nitrogen losses. Much of the research was done on participating producer farms, improving the effectiveness of adoption and the to take advantage of peer-to-peer learning. Performance Target (from Grant Proposal): 60 dairy farmers in Maine, Vermont and Massachusetts will adopt cover cropping and reduced tillage strategies in corn silage systems on at least 3,000 acres to reduce fossil fuel costs (diesel and N fertilizer) by $30-$35 per acre, improve soil and nitrogen conservation from manure nutrients by $20 per acre and improve forage quality and profitability through reduced purchased grain inputs by $65 per cow per year. 33 (out of 109) farmers who responded to our post project survey indicated they have adopted no-till corn and cover crop strategies on their farm to reduce costs since our project was initiated. These 33 farms represented 3947 acres in 2012. Data from NRCS indicates that in Maine and Vermont, 9473 acres of no-till corn was grown in 2012. Cover crop adoption in all three states (from survey and NRCS acquired data) indicates that acreage increased from 9,701 acres in 2008 to 15,882 acres in 2012, with an average cost of establishment of $30 per acre. Our research from University of Massachusetts data collected as part of this project indicates that fall cover crops recover and supply at least 30 pounds of N per acre to the succeeding crop. With nitrogen costs a nearly $1/pound, the cover crop expense is covered by the nitrogen savings alone, without even considering the soil and water quality benefits. Our survey data also indicated that producers saved an average of 5.7 gallons of fuel/acre (~$23/acre) and 2.75 hours of labor/acre ($10/hr or $27.50 per acre) to save about $50 per acre by switching to no-till establishment. For the 9473 acres of no-till, that would represent approximately $478,000 in savings and nearly 54,000 gallons of diesel fuel not burned. All three states have 4 years of corn silage trials indicating that harvesting shorter season corn does not reduce total yield of dry matter and actually will increase quality (appropriate maturity and dry matter content). Data was not collected from farms using shorter season corn varieties and the impact of better quality on reduced grain purchases, although with corn at $7 bushel, the impact would be significant. As an example from the Maine 2012 corn silage trials, switching from a 94 day relative maturity corn variety to an 85 day variety would increase milk per acre expected yield by 3350 pounds of milk per acre. With milk at $20/cwt, that represents a difference in potential milk yield value of $670 per acre. This project involved three states and three different research methods. 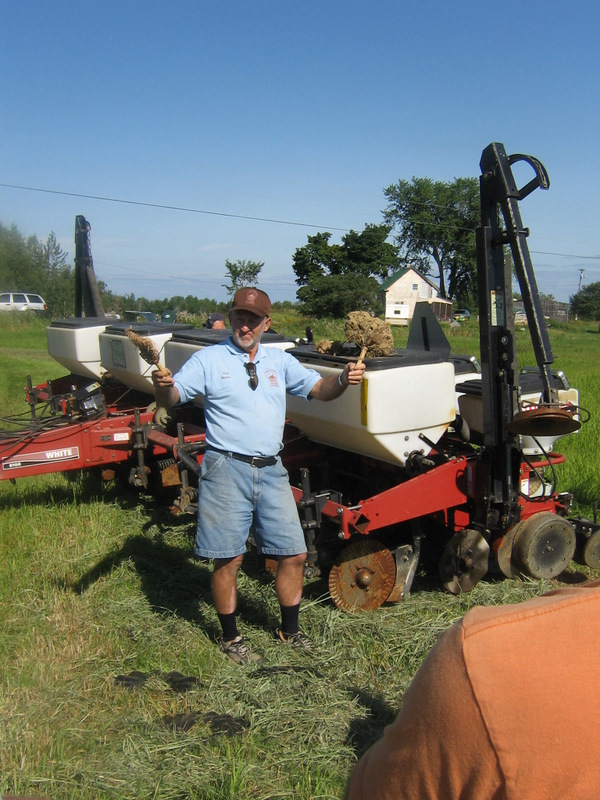 In Maine, under the leadership of Rick Kersbergen, work was done primarily on commercial farms with demonstrations along with trials (cover crop and corn variety) in managed replicated trials. These trials investigated cover crop establishment and nutrient (manure) applications on cover crops. Producers were compensated for their time and use of their land for these trials. One major participant led the way in demonstrating the retrofit of their planter to no-till along with utilizing cover crops as part of their switch to no-till corn. This producer now plants no-till corn with his planter for three other farms. Maine also hosted corn variety trials for all 4 years of the project at the host site for Maine Farm Days (Clinton and Leeds). In 2012, 42 varieties were included in the trial. Education activities included 3-4 presentations at numerous producer-oriented venues as well as in-service training for agricultural service providers as part of the Certified Crop Adviser (CCA). Yearly publication of the results from the corn variety trials were distributed widely. In Vermont, under the leadership of Heather Darby, numerous trials were held on various farms as well as the research farm in Alburgh. Heather’s trials included cover crop establishment and termination methods. It also included variety trial data and manure application techniques and reduced tillage experiments. In Massachusetts, Masoud Hashemi and Stephen Herbert concentrated on evaluating corn silage hybrids, cover crops and nitrogen management using cover crops and alternative manure applications. All three states conducted numerous field days for participants. Additionally, presentations were made at forage conferences, special no-till conferences, professional meetings and industry conferences. Each state provided many of their research results in hand-out form and published on state websites. 15 (five systems in three states) corn silage producers will enroll in an intensive three-year study investigating cropping systems that will reduce tillage and conserve soil and manure nutrients. Corn silage variety trials were conducted in each state for all 4 years of the project. Data from previous years were also used to evaluate the impact of relative maturity of corn hybrids and the yield response as well as quality response. Data from all these trials has been posted in previous years annual reports as well as the 2012 year in this report. Throughout the three states over the course of 4 years, there was little response to increased yield with longer relative maturity. While this was not the case every year or every site, the impact of choosing longer season hybrids was not outweighed by the beneficial economic and environmental benefits of successful cover crop establishment. This point was important as the researchers used this data to try and convince growers to select shorter season corn varieties so as to increase the potential for successful cover crop establishment and improved forage quality. Planting date, nutrient retention, termination, and alternative cover crop varieties were all investigated during this project. Cover crop adoption in all three states (from survey and NRCS acquired data) indicates that acreage increased for 9,701 acres in 2008 to 15, 882 acres in 2012, with an average cost of $30 per acre. Our research from University of Massachusetts data collected as part of this project indicates that cover crops recover and supply at least 30 pounds of N per acre to the succeeding crop. With nitrogen costs a nearly $1/pound, the cover crop expense is covered by the nitrogen savings alone, without even considering the soil and water quality benefits. Data from these trials are available as attachments to this report as well as attachments to previous year annual reports. 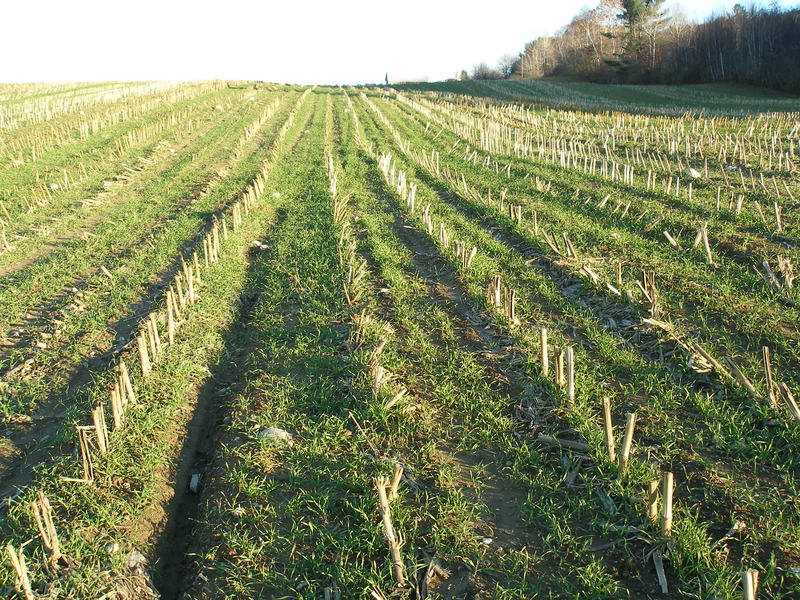 Each year of the project, new producers in Maine and Vermont adopted no-till production methods and incorporated cover crops into their no-till system. A final evaluation survey found 33 producers who had adopted no-till corn production out of the 103 returned surveys. Most of these producers cited economic reasons for the switch, including reduced fuel, labor (time) and improved first cutting haylage quality as a result of earlier harvest. Producers also cited improved moisture management and improved soil quality. Forage quality and relative maturity was charted for many of the corn trials. Producers were encouraged to rate varieties based on milk yield per acre rather than simple tons per acre. The silage performance indices of milk per acre and milk per ton were calculated using a model derived from the spreadsheet entitled “MILK2000”, developed by researchers at the University of Wisconsin. Milk per ton measures the pounds of milk that could be produced from a ton of silage. This value is generated by approximating a balanced ration meeting animal energy, protein, and fiber needs based on silage quality. The value is based on a standard cow weight and level of milk production. Milk per acre is calculated by multiplying the milk per ton value by silage dry matter yield. Therefore, milk per ton is an overall indicator of forage quality and milk per acre an indicator of forage yield and quality. Charts were developed in al the corn silage reports from Maine and Vermont that indicated which varieties would be high yielding and high quality. Our survey from 33 producers who returned the questionnaire indicates that producers saved 5.7 gallons of fuel/acre (~$23/acre) and 2.75 hours of labor/acre ($10/hr or $27.50 per acre) or about $50 per acre by switching to no-till establishment. For the 9473 acres of no-till, that would represent approximately $474,000 in savings and nearly 54,000 of diesel fuel not burned. Cover crop adoption in all three states (from survey and NRCS acquired data) indicates that acreage increased from 9,701 acres in 2008 to 15,882 acres in 2012, with an average cost of $30 per acre. Our research from University of Massachusetts data collected as part of this project indicates that cover crops recover and supply at least 30 pounds of N per acre to the succeeding crop. With nitrogen costs a nearly $1/pound, the cover crop expense is covered by the nitrogen savings alone, without even considering the soil and water quality benefits. This project in combination with UVM Extension’s Reduced Tillage program successfully planted 2000 acres of corn in Franklin and Grand Isle Counties in 2012. In addition to this, 850 acres of small grain and forage grasses were planting in 2012 using the Sunflower 9412 no-till drill. Working with the National BMP Challenge Program, three farms established side-by-side comparison trials of reduced tillage systems compared to conventional tillage. Detailed records of 573 acres have been documented including geolocation of fields acres, soil type, population, crop history, fertilization, specific tillage implement, cover crops, herbicides, strategies, difficulties, compaction and other anecdotal information from the farmers and the custom operators. The ongoing success of this project is generating interest from many conventional till farmers. These farmers are interested in the potential benefits of reduced tillage that their neighbors are realizing. Evaluating fuel usage was a difficult component of the project. Trying to collect fuel usage during an extremely busy part of the growing and harvest season was difficult and often anecdotal. We utilized a post-project survey for producers to evaluate fuel usage in gallons from prior to post no-till adoption. Weather extremes also played a huge role in the collection of nutrient data (extreme moisture in 2009 followed by dry years in 2010 and 2011). What producers all indicated was that corn grown under no-till management may not have always been the highest yielding; it was always less impacted by weather extremes (both moisture an drought). Workshops in 2009 reached over 500 participants, including farmers, consultants, extension faculty and NRCS staff. A “Conservation Tillage Tools” workshop was held on January 26th in St. Albans, VT. Three farmers from the region gave presentations describing how they implement reduced tillage into their cropping systems. In addition to the 3 farmers, a well known crop consultant from Central New York, “No-Till Tommy” Kilcer gave a well received presentation on reduced tillage. More than 75 producers from all ends of the state attended the workshop. One farmer interviewed after the workshop stated that he was going to “park his harrows” in 2010. As a result of the workshop, 50 % said they were going to try a reduced tillage method in the coming growing season. A Field Day was held at Windfall Acres owned and operated by Wayne and Nancy Fiske in Franklin, Vermont on June 21, 2010. Joel Myers from Pennsylvania No-till Alliance, a renowned speaker on cover crops, no-till and improving water quality was in attendance as well as farmers, members of local watershed groups, conservation district personnel, Vermont Agency of Agriculture Staff, and NRCS personnel. Joel spoke extensively about reduced tillage and no-till, soil quality and equipment. He showcased different reduced tillage implements and described best management practices for using zone tillers and strip tillers. There were 65 attendees at the meeting including farmers, NRCS staff, and other agency staff. Research trials were highlighted at a day long summer field day held at Borderview Research Farm on August 9th, 2010. There were 234 attendees that included farmers, students, crop advisers, NRCS, NRCD, and other Agency personnel. There were attendees from throughout the region including representation from PA, VT, NH, MA, CT, and from the Canadian provinces of New Brunswick, Quebec, and Ontario. The day highlighted several trials including corn maturity trials, cover crop termination study, tillage strategy corn study, cover crop planting method study. On September 13th, a presentation on cover cropping strategies (including the SARE project results) was given at a Cornell University Field Day held in Hudson Falls, New York. The theme of the on-farm field day was minimum tillage seedbed preparation, manure incorporation, and cover crops. There was an Aerway tillage tool and other tillage tools demonstrated at the field day. There were 38 Farmers, Certified Crop Advisers, Extension, NRCD, and NRCS present. Two videos have been produced highlighting reduced tillage. One showcases a farmer who has already converted his conservation planter to plant no-till (follow link to view: http://www.youtube.com/watch?v=kTAT9dB1qZM). The other shows Joel Myers demonstration to test the aggregate stability of 3 soils from different cultivation regimes including; 1- long term no-till, 2- sod-row crop rotation, and 3-heavily tilled intensive vegetable production (follow link to view: http://www.youtube.com/watch?v=zVYtG6UWwLI). 1) In summer 2010 a twilight meeting was held on August 12th at the Pearson Farm in Millbury, MA. In this meeting over 40 farmers and agency staff participated and observed the on-farm research project conducted at Pearson Farm. The merit of on time planting of cover crops and some alternatives for earlier harvest of corn silage and therefore earlier cover crop planting were discussed. 2) Over 150 participants in UMass Extension annual summer field day that was held on August 11 observed and discussed all research activities including those related to this project with researcher and farmers. 3) A part of the results from cover crop experiment was presented in ASA-CSSA-SSSA annual meeting in Long Beach, CA (Oct. 31- November 3, 2010). 4) Some results obtained from this project published in “Crops Dairy, Livestock, Equine Newsletter” Vol. 13-1, 2010, and Vol. 14-1, 2010 and mailed to over 1500 recipients in electronic or hardcopy form. 1) Presentations were made on no-till corn silage production and cover crop strategies at the Maine Agricultural trades show in January 2010 (104 participants and 18 participants respectively). 2) Another presentation was made at the Blue Seal Grain Company open house with 45 farmers in attendance. 3) A spring and summer meeting was held at Gold Top Farm where one of the cover crop trials was conducted to evaluate planting date and winter grain variety (Wheat, Triticale and Rye). Six farms in the Waldo County were in attendance. 4) A no-till /cover crop conference was held on Dec 9th in Waterville. Speakers included Jon Stika from North Dakota discussing soil health. Presentations also included a farmer panel of 5 farms who shared their experiences with cover cropping and no-till production. There were 45 producers, 12 NRCS staff and 10 University or NGO representatives at the conference. -225 farmers at UVM Crops and Soils field days in Alburgh that highlighted much of the research in this project. -75 farmers attended one of two workshops where Kersbergen presented information on adopting no-till corn silage production and the effective use of cover crops. -110 farmers earning a pesticide re-certification credit while learning about no-till research in Maine and Vermont associated with this project. -9 Extension and USDA employees visiting an on-farm research site as part of a SARE PDP tour. -27 farmers attending a seminar on no-till corn silage production where one of the participants was awarded the county “Outstanding Cooperator”for their work in adopting no-till corn and using cover crops. -63 Certified Crop Advisors attended a new England training where a session was devoted to research and demonstration results from this project. -A summary of results of the projects presented above were presented at Massachusetts Dairy Farmer (MADF) Summer Picnic on July 22, 2011. – Participants in Crops, Dairy, Livestock field day on August 2nd and 3rd , 2011 at UMass Research and Education Research Center visited all 4 research projects and grant coordinators discussed the rational and previous year’s results with farmers. -Dr. Herbert presented a talk on the importance of cover crop-corn cropping system at In-service training for agricultural service providers in January at New Hampshire and discussed the importance of on-time planting of cover crop with the participants. Presentations on reduced tillage projects were given at several venues including 4 UVM Crop Meetings throughout the state. A reduced tillage workshop was held at Champlain Valley Equipment during March in Swanton, VT. There were 40 participants that came to learn about reduced tillage equipment, cover cropping projects, manure injection, and GPS monitoring systems. 80% of the farmers responded that they were interested in trying reduced tillage and needed more education and experience to feel comfortable enough to experiment. Through the workshops farmers were able to connect with Scott Magnan’s Custom Service to sign-up for no-till planting. In addition, 4 farmers were able to sign up for a no-till retro-fit on their current planter (funded through another grant EPA 319 funds). A reduced tillage field day was hosted by Wayne and Nancy Fiske on June 27, 2012 in partnership with the Friends of the Northern Lake at Windfall Acres in Franklin, VT. There were 50 attendees including farmers, custom operators, conservation planners, and other interested water quality professionals. The workshop highlighted current water quality projects including the America’s Great Outdoors National Water Quality Initiative in association with critical source area mapping, cover cropping research/demonstration, and no-till projects/research. There was also much discussion regarding different field tiling systems and the effect on yields, nutrient uptake by crops, and land productivity. Farmers were provided handouts with all research information. In addition, the custom operator working with UVM to plant reduced tillage fields gave detailed information on his experiences working with a variety of soil types and tips for successful implementation. A no-till demonstration was held on August 9 during the Northwest Crops and Soils Annual Field Day. Reduced tillage equipment including planters, drills, Aerways, and manure injectors was demonstrated and discussed. Attendees also viewed and learned about results from cover crop termination, minimum tillage, and short season corn research projects. Information learned and adopted over the duration of this project was shared with over 250 people attending the field day. -Mashoud Hashemi and others presented some of the results in the 2012 twilight meeting in Lunenburg, MA on July 18, 2012. -156 farmers earned pesticide and nutrient management credits while hearing about the results of our no-till and cover crop research at the Agricultural trades show in January of 2012. Many of the participating farmers in our project attended and shared their experiences. -42 professional agronomists attending the New England In-Service training for agricultural professionals learned about the research results and the impacts of adopting alternative methods of growing corn silage with the use of cover crops. -55 farmers attended a no-till and soil health workshop in Waterville featuring Ray Archulta from NRCS. This workshop stimulated a lot of discussion about soil health with the use of cover crops and nutrient cycling in no-till systems. -A corn production workshop in Augusta hosted by “Ag Matters” featured a presentation on reducing fuel and fertilizer with no-till and cover crops. Nearly 85 producers attended, including potato growers who grow corn in rotation with potatoes. -Maine Farm Days hosted the corn silage trial at Misty Meadows Farm in Clinton, with several thousand participants. A presentation on no-till corn and cover crops was delivered to 45 farmers who received pesticide credit for their attendance. -A session on no-till corn, cover crops and soil quality was part of a three day series of seminars organized by University of New Hampshire as part of their fall agronomy series in November of 2012. Research reports were prepared for all the years of the project and can be accessed through the annual reports and attached links. This final report has the research reports from Maine, Vermont and Massachusetts for 2012. A detailed description of outreach efforts has been documented in the report under the last milestone of the project. All three states utilized various tools as part of our outreach for this project. Field days were held in each state during the growing season, either as a stand-alone day focused on no till or as part of research field days on experiment station farms. Outside experts were utilized as part of the outreach effort with either field demonstrations or as speakers in winter meetings. These included Joel Myers (Pennsylvania), John Stika (North Dakota), and Ray Archuleta (USDA NRCS). All of these “experts” were very well received and added credibility to our efforts and knowledge base. Additionally, farmer panels of participating producers at winter meetings in Maine provided a great educational experience for all participants and often influenced the decisions of farmers who were considering making a change. Researchers in the project also utilized professional development opportunities to discuss the results and impact of the project with other agricultural professionals throughout New England. Most notably is the New England in-service training for Agricultural Professionals two day training held in Maine or New Hampshire. This program brings together 60 to 70 educators, private consultants and company representatives. Each year of the project, a 30-45 minute seminar was presented about our research and demonstration trials. Our verification process included mailings to all dairy farmers who grow corn silage and cover crops in Maine, Northern Vermont and Massachusetts with a survey evaluating adoption, costs and benefits and production issue identification. A large number of producers (31 of 33) who adopted no-till corn with cover crops were happy with the results and indicated that it was of economic benefit to their farm. Most indicated that the switch to this alternative system was as a result of educational meetings and demonstrations associated with this project along with peer learning from well respected farmers who also adopted no-till. Issues identified include manure (ammonia nitrogen) losses with surface applications of manure (and increased potential for odor complaints), poor germination under certain conditions, reduced weed control options and increased potential for pest problems including armyworms with the use of cover crops. A number of very influential growers who adopted no-till in 2009 and especially in the dry year of 2010 in Central Maine assisted with adoption by other growers. Additional research by partners in New York on double cropping of cover crops (Rye or Triticale harvested before no-till corn) also generated interest in our research and subsequent adoption. Several agricultural professions in the private sector (crop consultants) became very interested in no-till and cover crops after seeing some of the benefits and hearing positive comments from clients. The project did generate some negative publicity from organic dairy farmers who indicated that the use of no-till corn silage was heavily dependent on herbicides and GMO corn varieties (Specifically glyphosate tolerant corn). Cover crop adoption in all three states (from survey and NRCS acquired data) indicates that acreage increased from 9,701 acres in 2008 to 15, 882 acres in 2012, with an average cost of $30 per acre. Our research from University of Massachusetts data collected as part of this project indicates that cover crops recover and supply at least 30 pounds of N per acre to the succeeding crop. With nitrogen costs a nearly $1/pound, the cover crop expense is covered by the nitrogen savings alone, without even considering the soil and water quality benefits. Our survey data also indicated that producers saved 5.7 gallons of fuel/acre (~$23/acre) and 2.75 hours of labor/acre ($10/hr or $27.50 per acre) or about $50 per acre by switching to no-till establishment. For the 9473 acres of no-till, that would represent approximately $478,000 in savings and nearly 54,000 of diesel fuel not burned. We were not able to quantify the benefits of an earlier first crop haylage harvest by producers who adopted a no-till corn program on their farm. We do feel that this impact is significant and would be indicated by either reduced purchased grain costs, improved cow performance and health or a combination of all these. The increase in acreage of cover crops and no-till corn silage can be attributed to a variety of factors, including the educational impacts of this project. Cost share incentives under the USDA EQIP program for cover cropping helped to offset the additional costs and time associated with planting fall cover crops and served as a financial incentive for farmers. With the large increase in nitrogen fertilizer prices, practices that an reduce costs serve an additional benefit beyond soil conservation and erosion control. High fuel prices during the period of this project also served as an additional incentive, as farmers looked to cut expenses at a time of poor and fluctuating milk prices. The reduction in fuel usage during planting comes at a time when farmers face a negative cash flow, so it is even more important as other planting and harvest costs go up (seed, herbicide, labor, parts etc.). Finally, the incentive to reduce time of planting was used by the researchers in the project to further enhance the benefits. Since the quality of first cutting haylage is so dependent on early harvest, the ability of farmers to get corn planting completed earlier and first cutting harvest started, pays dividends that are realized through the following year in reduced grain costs, improved performance and healthier cows. Of the farmers who responded to our survey, nearly 40 % cited improved moisture control as an additional benefit along with improved fertility and/or reduced fertilizer requirements. Concerns expressed about adopting no-till and cover crop use included increased insect pressure (armyworms) and the need for additional scouting and potentially insecticide application, issues related to manure application, including ammonia loss and increased odor, and crop germination in heavy soils (clay) where many producers feel fall tillage is a requirement. Of the farmers who returned our survey, but have not adopted this system, 40 % indicate cite equipment costs as the barrier to adoption. Another 30% worry about yield loss potential and 20% are concerned about effective weed and insect control. 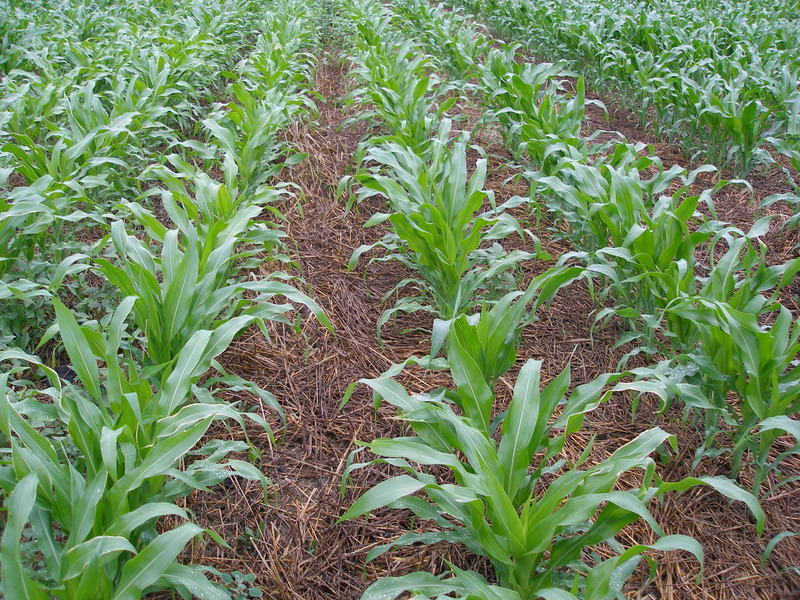 The concern about nitrogen management with no-till systems in New England demonstrate the need for additional research on application methods that might maintain the benefits of no-till with effective nitrogen management and ammonia conservation.